Branco, Cape Verde Islands, breeding site for White-faced Storm-petrel, Maderian Storm-petrel, Cape Verde Little Shearwater and Cape Verde Shearwater. The Cape Verde Islands are situated in the extreme southwest of the Western Palearctic, south of the Tropic of Cancer and only around five hundred kilometres west of Senegal. The archipelago consists of twelve main islands but on a comprehensive birding tour it is only necessary to birdwatch on four islands (Raso, Branco, Santiago and Boa Vista) but to reach these will require visiting a least Sal and São Nicolau, and probably São Vicente. Following a conservative approach to taxonomy the Cape Verde Islands hold six species of Western Palearctic endemic - Magnificent Frigatebird, Cape Verde Swift, Grey-headed Kingfisher, Raso Lark, Cape Verde Warbler and Cape Verde Sparrow. However, If the phylogenetic species concept is employed the islands hold a further eight Western Palearctic endemics - Cape Verde Shearwater, Cape Verde Little Shearwater, Bourne's Heron, Cape Verde Buzzard, Alexander's Kestrel, Neglected Kestrel, Cape Verde Peregrine Falcon and Cape Verde Barn Owl. Sadly, Cape Verde Kite is now presumed to be extinct (if it ever existed) whilst Bourne's Heron and Cape Verde Peregrine Falcon are both endangered. Additionally, highly sought after breeding seabirds in the Cape Verde Islands include Fea's Petrel, White-faced Storm-petrel, Madeiran Storm-petrel, Red-billed Tropicbird and Brown Booby. In the past the islands have produced some exceptional Western Palearctic vagrants including White-tailed Tropicbird (1999), Red-footed Booby (llhéu de Cima, August 1986), Black Heron (Boa Vista, February-March 1985) and Broad-billed Roller (Maio, November 1897 and Santiago, April 1924). Michael Hoit, Andrew Holden and Tom Lowe accompanied me on an eleven day visit that produced all the hoped for endemics except for Cape Verde Peregrine Falcon. A longer trip may be advisable given the unreliable reputation of the internal flights; previous birding trips have been hampered by strong winds and resultant dust storms causing planes to be cancelled. The cost of the whole trip, including visas, flights, taxes, booking fee, vehicles, drivers, fuel, accommodation and food, came to - an expensive - £1,340 per person. I could not find details of TACV flights on the internet and, not being able to speak Portuguese, did not contact TACV direct. Consequently I booked all the flights (except the two Easyjet flights) and accommodation through Yorkshire based travel agents Cape Verde Travel. Here, Ron Hughes and Lisa put together an excellent itinerary (based around my requests) and the subsequent trip ran smoothly. The total cost of this was £920. A main meal costs around £5, a bread roll 10p, a 5 litre bottle of water £2, a small tin of tuna 65p and a litre of petrol 78p. The essential guide for any birding trip to the islands is Dave Sargeant's 'Cape Verde - A Birder's Guide to the Cape Verde Islands'. This extended trip report includes details of almost all the sites (including good maps), an annotated checklist and practical information. This is a must and can be purchased from Birdguides for £9.99. I have referenced this guide throughout this trip report. In addition to this two trip reports of past Birdquest tours were helpful and I used Eurobirding.com to locate trip reports by Janne Aalto, Nico Geiregat, Erling Krabbe, Rob Payne and Pedro Tavares. Arnoud B. van den Berg, Leo Boon, Andy Clifton, Tommy Frandsen and Roy Taylor provided helpful information. An overview to birding the islands was given by Andreas Noeske and Setfan Pfützke in Birding World Vol.7 No.4: 152-160 'The Cape Verde Islands: tropical birding in the Western Palearctic'. Immediately after our return from Cape Verde, Arnoud B. van den Berg published an update in Birding World, 'Birding the Cape Verde Islands' Vol.18 No.2: 80-81. As a general guide to the islands I used 'Cape Verde Islands' The Bradt Travel Guide purchased from Amazon for £9.06 plus postage. A tourist entry visa costs Euro 45 (= £32.40) and is available on arrival at Sal Airport. Your passport must have at least six months left to run beyond your intended return date. All flights were with TACV unless stated otherwise. In general all TACV inter-island flights left between 30 minutes and one hour after their scheduled time. Our return flight to Paris Charles de Gaulle landed over two hours behind schedule, worth bearing in mind when booking a connection to the UK. One change in schedule by TACV was communicated to our hotel. As such it is worth informing the TACV office in Sal Airport of your accommodation and contact details. On reflection changes we would have made to our visit would have been to undertake the trip one week later, flying out from Amsterdam on 3rd March instead of 24th February. This would have improved our chances of seeing greater numbers of seabirds, in particular the late arriving Cape Verde Shearwater. However, this later arrival would have necessitated visiting Santiago first (followed by São Nicolau and Boa Vista) to maximise the chances of the Bourne's Herons still being present in the nest at Liberão. Sal has the only international airport on the Cape Verde Islands and as such is a necessary stopover en-route to other islands. We visited the two recommended birding sites on the island; Pedra de Lume (Sargeant p25) where a selection of common waders were present and Santa Maria (Sargeant p26). São Nicolau is the gateway to Raso. It is necessary to visit the west coast town of Tarrafal where a fishing boat can be chartered to reach Raso. Elsewhere on São Nicolau we birded the immediate vicinity of the airport, the Fajã Valley (Sargeant p22) en-route to Tarrafal, where Helmeted Guineafowl were seen and Punta da Barril for seawatching. Reached by chartered fishing boat from Tarrafal, São Nicolau, Raso (Sargeant page 24) is the famous haunt of Raso Lark as well as breeding Red-billed Tropicbirds and Brown Boobies. Following collection from Raso by our chartered fishing boat we were deposited on Branco for one night. The precipitous island of Branco is a breeding site for four nocturnal seabirds: White-faced Storm-petrel, Maderian Storm-petrel, Cape Verde Little Shearwater and Cape Verde Shearwater. Only visited as a connection en-route from São Nicolau to Santiago. São Pedro lagoon (Sargeant 22) was visited at dusk. Liberão (Banana de Riberia Sargeant 16) is the only remaining colony of Bourne's Heron (the colony at Boa Entrada (Sargeant 24) has been deserted). South of Pedra Badejo, Milho Branco is a former breeding site of Cape Verde Peregrine Falcon. São Jorges and João Teres (Sargeant 15) is a reliable site for Cape Verde Buzzard and Cape Verde Peregrine Falcon has been seen here in the past. Boa Entrada (Sargeant 14) is a good site for Cape Verde Warbler. Farmland south of Tarrafal proved reliable for Cape Verde Barn Owl. São Domingos is a (former?) breeding area of Fea's Petrel but we found Cape Verde Little Shearwaters here. The town of Praia (Sargeant 13) produced Black-crowned Finch Lark but little else. Pedra Badejo (Sargeant 17) produced Cape Verde Shearwaters on an evening seawatch. Sal Rei (Sargeant 26) produced little of note other than Red-billed Tropicbirds though nearby Rabil Lagoon (Sargeant 26) held a vagrant Purple Heron. Curral Velho (Sargeant 28) is the favoured site for locating Magnificent Frigatebird. llhéu dos Pássaros (Sargeant 28) is a tiny island off the east coast to which an overnight visit, reached by chartering a small fishing boat from Baie de Gatas, produced excellent views of White-faced Storm-petrel. The small sewage farm near the Ceris brewery no longer seems to exist. The kapok tree is now dead and Bourne's Heron no longer nests here. It is possible to drive the majority of the way to the kapok tree in a standard hire car. Cape Verde Warbler seems commonest by the track just northwest of the kapok tree. Boa Entrada is accessed off the main road between Assomada and Enacol petrol station along a minor road with a 'give way' sign. c5km north of Tarrafal is Punta de Barril where you can seawatch by the lighthouse. We saw at least 16 Helmeted Guineafowls north of the road on the second bend northeast of Cachação. After birding Raso it is possible to be collected by your chartered fishing boat and taken to the nearby island of Branco. You will be dropped off on a beach on the south side of the island. From here walk east along the shore until you reach a peninsula at the southeast end, Ponta Delgada. Behind the easternmost beach an area of sand holds many White-faced Storm-petrel burrows. Do not walk on the sand as the burrows will collapse. The White-faced Storm-petrels return to their burrows in darkness, we only saw one briefly at c00:30. However, we may have missed the main period activity whilst we were searching for a singing Cape Verde Little Shearwater on the rocky slopes between the landing beach and Ponta Delgada, and 2+ Madeiran Storm-petrels in the same area. We found several Cape Verde Shearwater skulls, evidence of the continued persecution of this species, but we were too early in the year for them to be returning to their colony. We camped overnight and were collected by our fishing boat at 08:00. Boa Vista: In the past has been heard at Tiberia do Norte (between João Galego and Norte), Sal Rei, Rabil and Rabil Lagoon. An introduced species to the Cape Verde Islands. São Nicolau: 16+ in the Fajã Valley on a vegetated hillside by the second bend north of Cachação (see Sargeant p22 for further sites). Previously recorded near the airport, near Carvoeiros and above Cabecalinho). Santiago: 30 Ribeira de Praia Formosa northwest of the road to Pedra Badejo c4km north of the junction near Ribeira Chiquerio. 3 southeast of Rui Vaz north of the road viewed from a layby on the ridge. Previously recorded at Liberão. Boa Vista: Apparently a more recent introduction to this island than to others. 60+ in scrub behind the beach between llhéu dos Pássaros and llhéu de Balaurate. Previously seen nearby at Riberia de Norte. São Nicolau: Perhaps as many as 30 were lingering distantly off Punta de Barril. Previously seen passing near Estãncia Brãs. 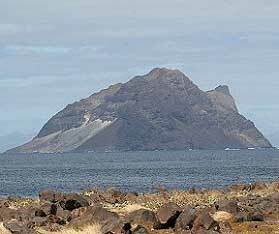 Raso: At least 10 seen from the Tarrafal boat crossing both to Raso and from Branco. All birds about one hour out of Tarrafal. Santiago: Two distantly off Pedra Badejo. Previously (?) bred in São Domingos valley. We recorded unidentified Calconectris shearwaters distantly off several islands. Raso: One from the boat c45 minutes out of Tarrafal. Past trips have recorded as many as 150 from the same crossing. It appears that our trip to Raso and Branco (26th-27th February) was too early for any number of this species to have retruned from their wintering grounds; this was confirmed by the fisherman. Branco: Too early in the season for them to be returning to their colony the only evidence of their past presence was several skulls. Santiago: Four north past Pedra Badejo on an evening seawatch. Previously seen off Praia and Tarrafal. Boa Vista: Previously seen off Curral Velho and llhéu dos Pássaros. Santiago: At least two were singing and seen in flight in the valley running southeast from São Domingos around 23:00. Audible from the layby on the south side of the road 700 metres west of the road junction north of Riberia Chiquerio. llhéu dos Pássaros: Although difficult to estimate the exact number involved, birds had returned by 19:45 and were still active at 03:45 with as many as seven birds together over the sandy centre of the island. Boa Vista: Singles at Sal Rei, Rabil Lagoon with several off llhéu dos Pássaros and colonies on llhéu de Curral Velho and llhéu de Baluarte. Has been seen off Riberia Grande in the past. Boa Vista: One male circling high of the beach to the east of llhéu de Curral Velho. A pair were present here in March 2004. In April 2003 a male was seen over Praia da Cruz and Rabil Lagoon. Also in April 2003 six (four males, two females) were on llhéu de Baluarte with at least one female being seen off nearby Ponta do Rife. Our 4x4 driver failed to access Ponta do Rife due to the poor state of the tracks. Boa Vista: A vagrant to the Cape Verde Islands, we saw a subadult at Rabil Lagoon. Santiago: The only remaining colony of this species is in a mahogany tree at Liberão (also known as Banana de Riberia Montanha). We saw 11 birds including eight juveniles in nests. Local conservationists reported that three juveniles had died recently; two killed by children and one falling from the nest. It is possible to drive to the tree in a conventional hire car. The Bourne's Herons are reported to commence breeding in August/ September with, in wet winters, a second brood in January/ February. When not breeding this species is very difficult to find, with the interior mountains pf the Serra do Pico da Antonia suggested as a likely feeding area. One was seen in flight near São Domingos in April 2003. At Liberão birds were feeding in dry gulleys on valley sides amongst stands of canes. At Boa Entrada the famous kapok tree is now dead and no longer holds a colony. Sal: Three north of Santa Maria on semi-desert east of the road near the first roundabout. Has also been seen near Pedra da Lume. Boa Vista: Widespread in desert areas, common near Curral Velho. Santiago: Soon after dusk one showed very well south of Tarrafal near the sewage works, over farmland by the farm buildings. This appears to be a reliable site. Access along minor roads west from the main road. Further birds crossed the main road c9km south of Tarrafal and just west of Boa Entrada. Based on previous reports this species appears widespread on Santiago with sightings at Liberão, São Jorges dos Orgãos, Residencial Sol Atlantico in Praia (situated on the raised plateau just south of the TACV office and adjacent to the main square) and near the mouth of the river at Praia. Santiago: Common and widespread, particularly in the interior e.g. 25 seen between São Domingos and Liberão. Santiago: Four just east of Praia on waste ground behind the Shell depot with a further male in Praia near the lighthouse. Previously seen just south of Tarrafal near the sewage works. Santiago: At least 7 at Boa Entrada in trees by the track northwest of the dead kapok tree. Also occurs at São Jorges (in the valley below the village), at Liberão with odd records from Pedra Badejo, São Domingos and in Praia at Residencial Sol Atlantico. Common on all islands visited. Santiago: We recorded a possible white morph at Tarrafal on rocks by the beach immediately north of the town. This rare but regular visitor to the Cape Verde Islands has previously been recorded at the sewage works south of Tarrafal, at Pedra Badejo and in Praia (at Praia the pools by the brewery no longer exist and we could not find an egret roost). A vagrant to the Cape Verde Islands. São Vicente: In the recent past this species has been seen roosting with Cattle Egrets at Mindelo sewage works. Sadly, presumed to be extinct, if indeed it ever existed as a species. In 2002 The Peregrine Fund located and captured five kites (of six birds present at that time) on the island of Maio and, following genetic analysis at the University of Michigan, it was determined that they were Black Kites and not Cape Verde Kites, as had been hoped. Furthermore, analysis of historical specimens of Cape Verde Kite collected between 1897 and 1924 (including the original specimen) suggests that Cape Verde Kite is not a species, but a Red Kite. Therefore, four kites reported on Boa Vista in March 2003 were presumably Black Kites. Described as 'widespread but very rare' by Sargeant. Santiago: Until 2004 a pair nested on a cliff at Riberia da Praia Formosa, north of Milho Branco, by the main road to Pedra Badejo, c4km north of the junction at Riberia Chiquerio. The other site where this species has been seen are the northeastern slopes of Pico do António viewed from near São Jorges dos Orgãos and the cliffs east of Praia.